Collection sheds light on a renewed Jewish culture in Communist-era Poland. 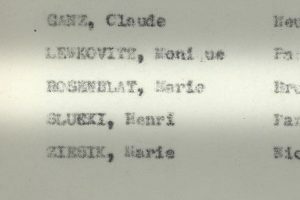 In a report submitted by Akiva Kohane, JDC Country Director for Poland, about his recent visit to Poland in November 1983, Kohane remarks that around 1,000 people turned up for a performance by Szymon Szurmiej, Artistic Director of the Yiddish Theatre, and a group of Yiddish actors. Strikingly, in a country where the Jewish presence was diminished by the waves of immigration that began following World War II and continued through the 1970s, and where Jewish life was restricted, an impressive number of people were still interested in Yiddish theater. 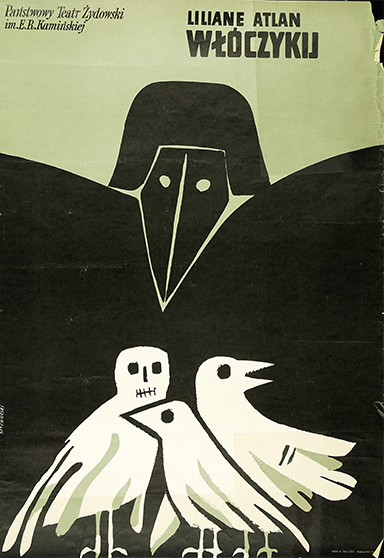 The JDC Archives’ small collection of about 15 Polish theater posters created for the Polish State Yiddish Theatre (Państwowy Teatr Żydowski) in Warsaw, in the 1970s–early 1990s, is a trace of this period. The school of poster art in Poland flourished from the early 1950s until the late 1980s and produced dozens, if not hundreds of talented graphic artists, whose creativity was not silenced by the oppressive Communist regime. The graphic artists Marian Stachurski (1931-1980), Slawomir Lewczuk (b. 1938), and Andrzej Pagowski (b. 1953), who grappled with the tragic history of the Jewish community in Poland through their art, are among those featured in the JDC Archives poster collection. One such poster, by Andrzej Pagowski, was created for the play The Poem about the Murdered Jewish People based on the poem of the same name by Itzhak Katznelson (1855-1944), a Hebrew and Yiddish poet, children’s books writer, and playwright. Katznelson’s poetry, written from 1939-1944, emerged as some of the most expressive literary achievements of the Holocaust period. Katznelson lost most of his family in the Holocaust and perished in Auschwitz. Miraculously, his poems survived and were published shortly after World War II. 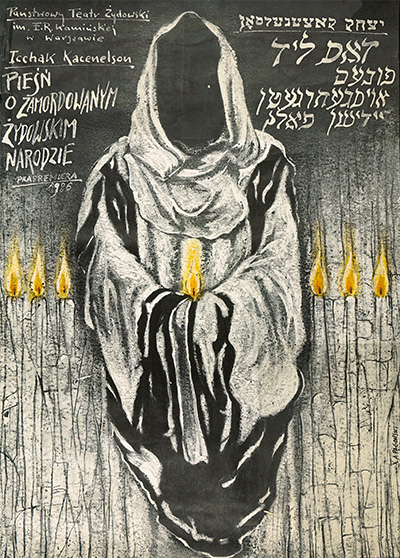 The production premiered at the Warsaw State Jewish Theatre in 1986.The poster advertising the play depicts a faceless figure of a religious Jew, wearing a tallit and holding a burning candle. 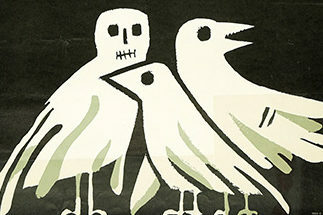 The monochromatic, washed-out background evokes a feeling of dread, reflected in the play’s title. The poster publicizing a play based on Liliane Atlan’s novel The Passerby, is an interesting interpretation of Holocaust subject matter. Rendered by Marian Stachurski in 1975, it features a large black bird-like creature shielding smaller birds with its outstretched wings. The style is reminiscent of early Picasso sculptures, with obvious tribal influences. The black hollow eyes and stitched mouth, together with other dark colors, produce an effect of horror. Liliane Atlan (b. 1932) is a French-Jewish writer, whose work has been deeply affected by the experience of the German occupation of France and the collaborationist regime of Vichy. Atlan’s background in Jewish philosophy and mysticism is reflected in her intense writings that are built around questioning her Jewish identity. Her novel The Passerby (1989; English translation – 1999) is an autobiographical narrative of a fourteen-year-old girl who internalized her adopted brother’s account of the concentration camps to the extent of becoming anorexic herself. JDC played an important role by helping to fund the revival of Yiddish theater in Poland in the 1980s-1990s. 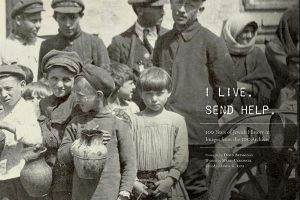 The beautiful posters in the JDC Archives collections represent a snapshot of the culture that was still present in Poland even when a major portion of the prior population was no longer there. Polish Jewish artists participated in this revival as well, as attested by the signatures on these posters. Despite the propaganda aspects of posters in countries of the Eastern Bloc, Polish poster art was never simply a vehicle for advertising. It managed to overcome its narrow social function and became an art in itself, displaying a variety of styles, from surrealism to abstraction and folk art, thanks to the high level of artistry and creativity of the people behind it, as well as the deep connections with the art world of Western Europe, which did not stop even during the decades of existence under the Soviet power. 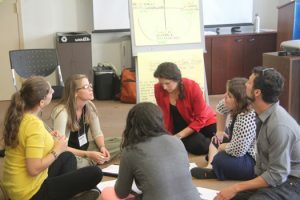 This piece was written by Oksana Rosenblum, who interned at the JDC Archives. It was shared with her permission.